So for those of you who don’t know I’ve recently gotten into duck paintings. There are a couple of reasons behind this, and I’ll save most of that for anther post. 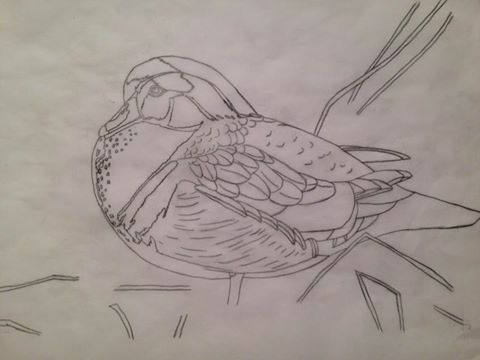 All you need to know is that they’re typically done for stamp contests, and they’re realistic style paintings that feature specific species of waterfowl. I recently just submitted a painting (my first realism type painting) for the Michigan Waterfowl Stamp Contest, which will take place on August 1st, so you will hear more about the stamps from me around then. For now I just wanted to give some brief background. 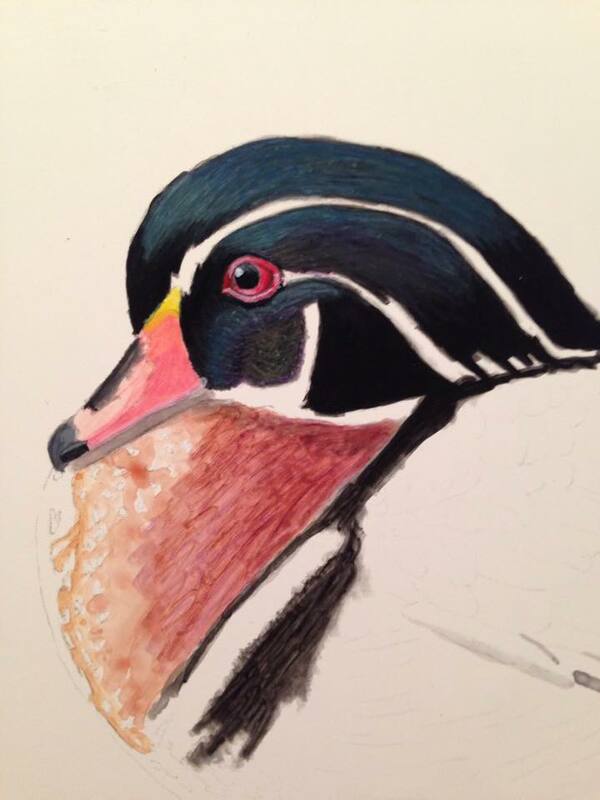 Currently I’m working on a painting of a drake wood duck. This piece is not for a competition and is more just for fun for myself. Here is the drawing that was then transferred to claybord to be painted. I had a break in some school work the other weekend, so I had a few hours to myself to sit down and paint. I laid down some basic colors, and then it became time for the more detailed stuff. I was feeling pretty good about the whole thing, until I realized it was going to be harder than I thought. I was discussing things later with another artist who said they had a very similar thinking pattern when doing art. Here is a snippet from my conversation with the artist, to give you some insight into my thoughts at the time. What is the point of this post? Mostly as a friendly nudge that we all panic and think we’re not doing a good job with art. We all have freak out moments for sure! Just keep your chin up and push through! At the very least it’s a learning process, at the best you get something really great out of it, that you might not have achieved had you just quit earlier. Here is my painting after 3 hours. It still has a long way to go, but it’s coming a long and starting to take shape now. I can see where it’s going at least. As an artist, what kind of crazy thoughts do you have while painting? If you’re not an artist but an art appreciator do you find it surprising that we go through so many emotions while painting?